I go to Seattle maybe once or twice a year for work. My company is based in a Seattle suburb, so the opportunity comes up somewhat regularly. 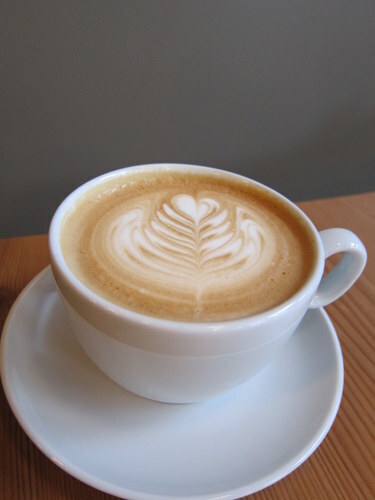 Seattle is famous for coffee, or maybe infamous for coffee. But despite the big brand name that was born out of that fair city, there are plenty of independent shops that serve some fine coffee. One thing that you see regularly is drive-thru coffee spots. We just do not have these around here. And no, Dunkin Donuts drive-thrus do not count. 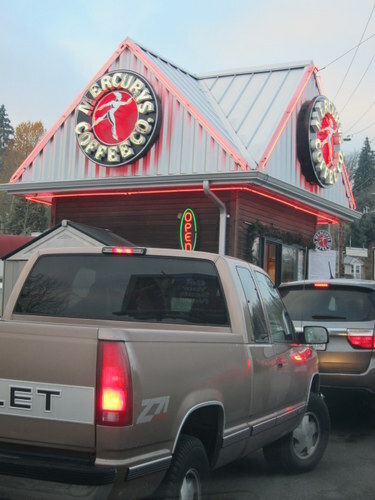 Mercurys was a drive-thru spot that I stopped at every morning before work. Service was friendly, quick, and the coffee was great. I did not, however, see any of those bikini drive-thru spots. A wonderful coffee shop in Fremont is Milstead & Co. It’s fairly roomy and stark, but that doesn’t mean it’s cold. It’s still warm and inviting. And their coffee is amazing. Their pastries too. It was a cold and drizzly day when we visited, and it felt like the most perfect place to be at that time. 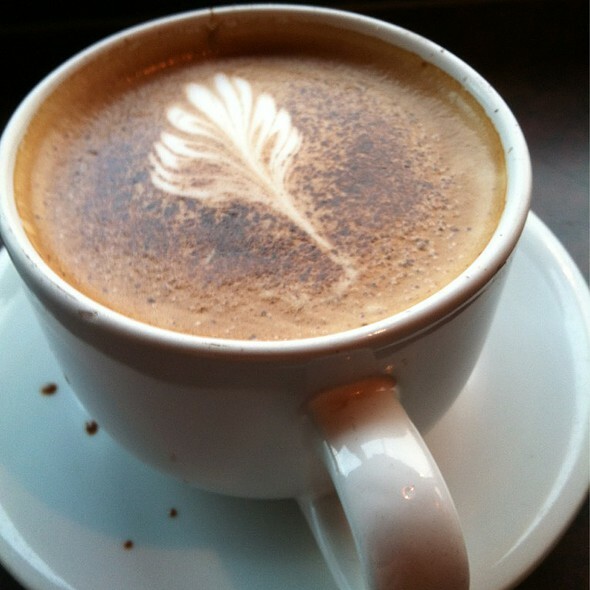 We also stopped by Citizen for the most beautiful latte art I’ve ever received. 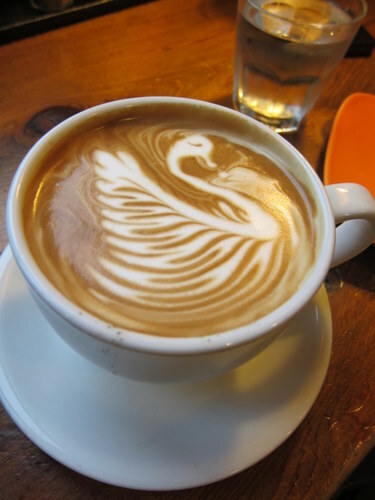 Behold the swan! This spot is in an adorable house type of building. 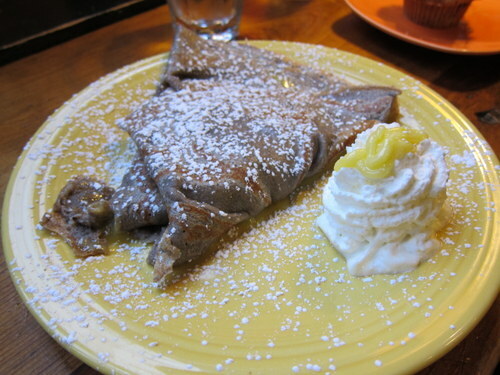 They have a bunch of food too, including crepes! This simple buckwheat crepe was perfect. 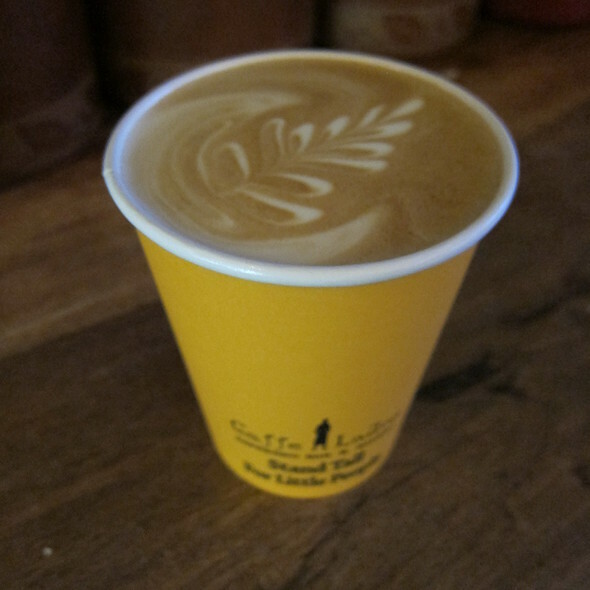 Caffe Ladro runs a number of shops in the Seattle area, and I stopped at a couple. They not only have good coffee, but I had an amazing hot chocolate. We we stopped at one downtown, the proprietor took a very long time to make it, and it was worth every bit of the wait. It was full of hot chocolate love. And for cold and dreary Seattle days, it was even better than a coffee. 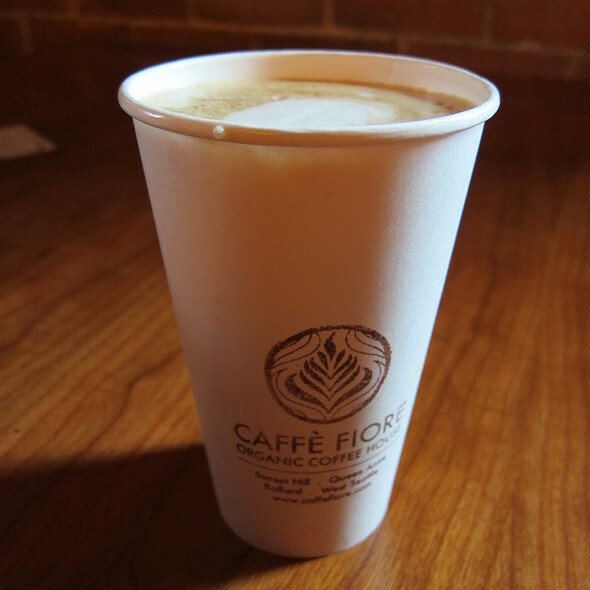 One last stop worth mentioning on this random post is Caffe Fiore. 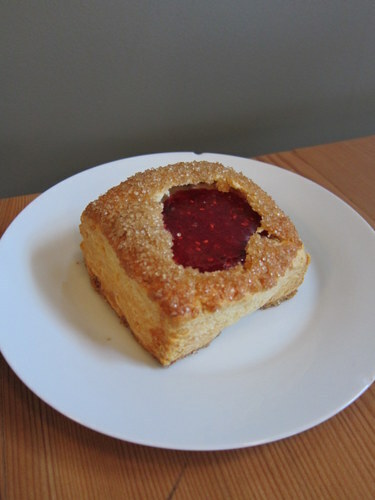 They are an organic coffee house with several locations. I remember this particular shop in Fremont being very very busy. So you see, just like every other big city in the US, there are plenty of local independent coffee shop options, even in Seattle. Instead of heading into the city, I decided to spend my last night in the burbs and ended up busting a gut at BCD Tofu House in Edmonds. I’ve been to one before in LA, so I knew what to expect. I ordered a spicy pickled crab & tofu combo. I got a whole bunch of banchan, including this entire grilled fish. It’s impossible to go hungry here. 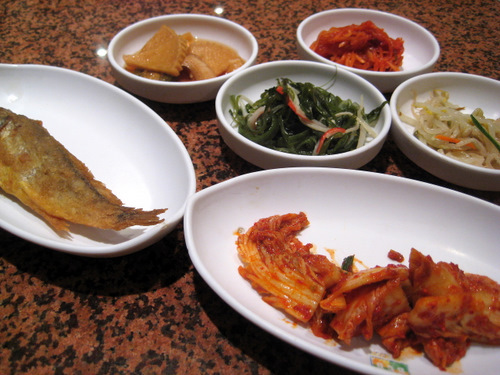 This banchan wasn’t particularly amazing, but it was just fine. Here’s the crab. 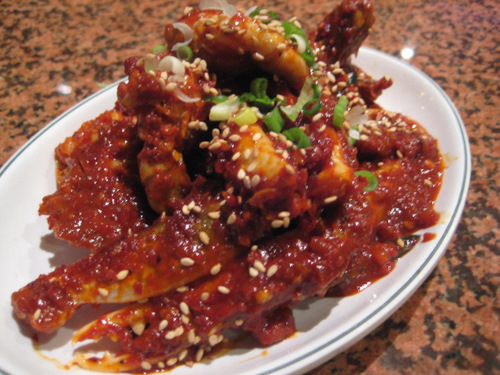 Typically, it’s one of my favorite korean dishes of all time. Here, it was only ok. The crab didn’t taste that fresh and the flavor was only so-so. But heck, there was tons of it! And most of the crab was claws, which a lot of you probably prefer. 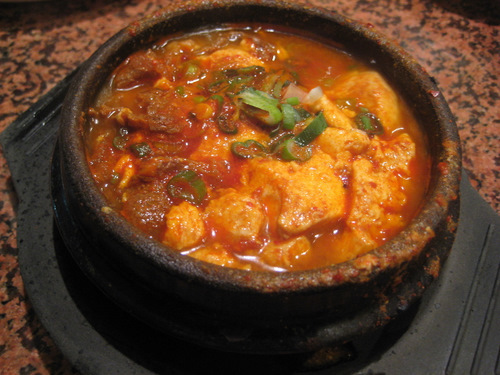 Here’s my little steaming cauldron of soondubu! Yum! I think there was beef and seafood in this. It just seemed to have a little bit of everything. It was also ok. 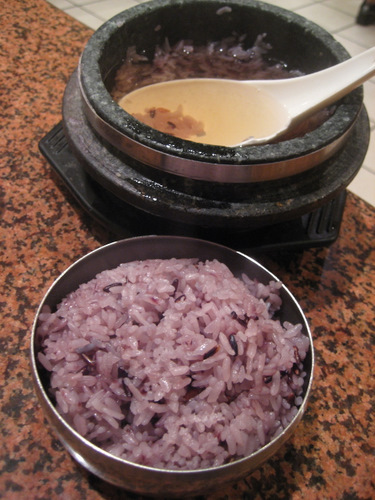 They have the “purple” rice here, which is cool. The rice comes out in its own little cauldron, but when the server comes out, she transports the rice into a metal bowl and then leaves the leftovers in the cauldron with you. Then she fills the cauldron with hot water. Then you can mix up the water with the leftover rice and also eat that. 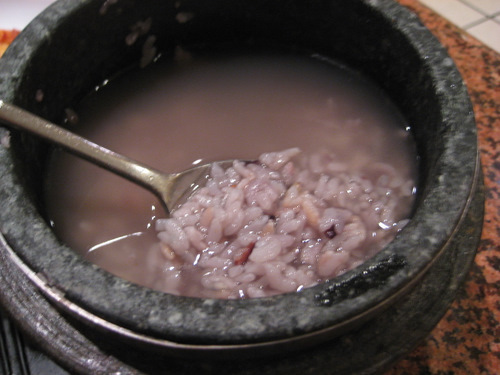 It’s actually probably my favorite part of such a soondubu meal, even though it’s probably the most boring! This place is pretty small, and there’s only one server working in the whole place. Despite this, the service was quite fine and the food came out quickly. Since I can’t get ramen at home, whenever I’m in a place where I can, I get it. 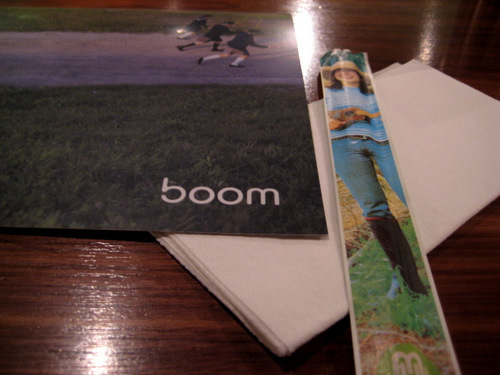 Upon Shirley‘s recommendation, I went to Boom. It’s by the same people who run Blue C Sushi, which is a Seattle conveyor belt sushi place. There are a couple of Booms in the area and I visited the one in Bellevue, which is connected to a Blue C. The place is big and modern, with a bar, lounge, and dining area. I decided to try the pork buns just for kicks. I had no idea if they’d be decent, and to my surprise, I liked them! The buns themselves were warm and soft and fresh. 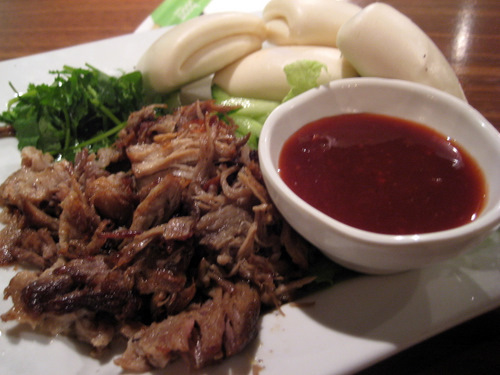 The pork was shredded and fatty, which made it a bit juicy. For veggie fillings there was lettuce, cabbage, cucumber, and cilantro. It was all served with a ginger cherry plum sauce. Really, these were pretty good! I wanted some spice so I got the kimchi tofu, with braised pork, tofu, kimchi, raw egg, and green onion in a spicy miso broth. 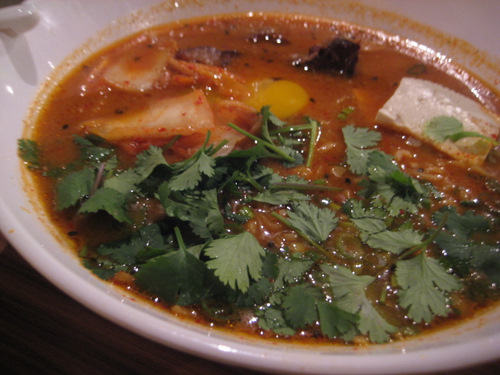 The broth, kimchi, and the noodles were all pretty good, but it was a bit weird. The pork was in big hunks. It made it hard to eat. They really should think about slicing it. I liked the tofu quite a bit. But cilantro in kimchi ramen? Do they not know how much old korean ladies tend to abhor cilantro? To mix cilantro and kimchi is a bit scandalous. It was still nice to eat ramen though. I already miss it. Service was meh. I ordered a drink but I never got it. Yep, the server just completely forgot about it. At least he didn’t charge me for it, that would have made me livid.